These are a more traditional 5-spoke rim (than the Saw Blades). DANVILLE, Virginia (August 18, 2018) – Corvette Racing will start from the second and fourth rows of the IMSA WeatherTech SportsCar Championship at Virginia International Raceway following a somewhat damp qualifying session for Sunday's Michelin GT Challenge at VIR. Antonio Garcia qualified fourth and Tommy Milner seventh in GT Le Mans (GTLM), which has headliner honors this weekend. 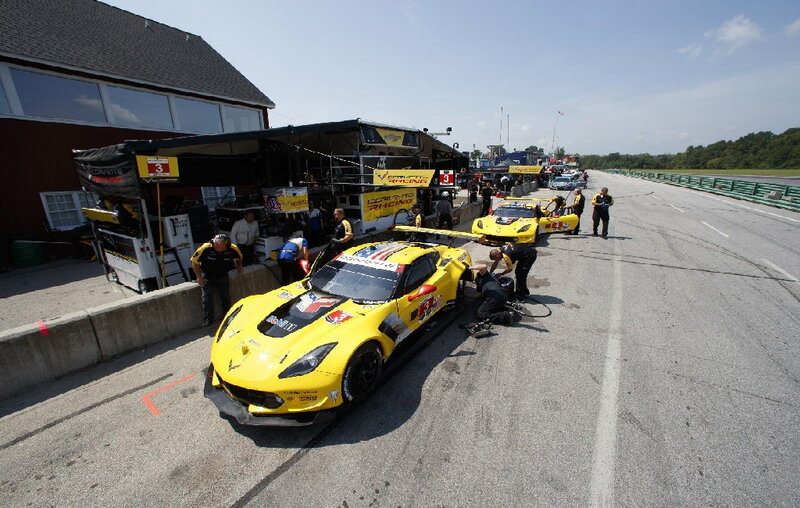 Corvette Racing will go for its fourth victory at VIR in seven tries and third in a row. A steady rain enveloped two-thirds of the 3.27-mile, 17-turn circuit just ahead of GTLM qualifying. As a result, the difference in conditions on opposite sides of the track made the driving and strategy tricky. Had it remained dry, Corvette Racing likely would have been in strong condition for pole position; Garcia was quickest in Friday’s second practice and Milner was fastest in Saturday morning’s final session. Garcia set a best lap in qualifying of 1:56.760 (100.821 mph) in the No. 3 Mobil 1/SiriusXM Chevrolet Corvette C7.R that he shares with Jan Magnussen. The duo has made VIR its playground the last two years with consecutive victories and a pole position for Magnussen in 2016. Garcia and Magnussen are second in the GTLM Driver’s Championship with three races remaining – four points behind the leaders – and have finished on the class podium in the last five IMSA races. Milner’s best time was a 1:57.492 (100.193 mph) in the No. 4 Mobil 1/SiriusXM Chevrolet Corvette C7.R, which he will drive with Oliver Gavin. They were class winners at VIR in the 2012 American Le Mans Series race, and Milner set the fastest race lap a year ago. Gavin and Milner stand fourth in GTLM points with a victory earlier this year at Long Beach. The Michelin GT Challenge is set for 1:05 p.m. ET with FOX Sports 1 airing the race live from 1-2 p.m., followed by coverage on FOX Sports 2 from 2-4 p.m. Streaming in-car footage along with live audio coverage of practice, qualifying and the race from IMSA Radio is available on IMSA.com.